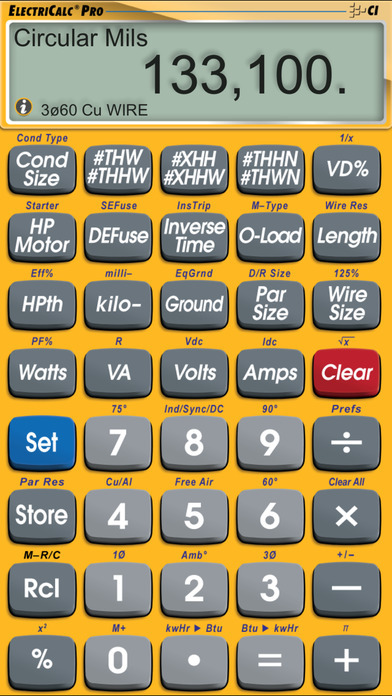 The official US-based National Electrical Code® (NEC) ElectriCalc® Pro from Calculated Industries for iOS is a full-featured emulation of our popular #5065/#5070 models. 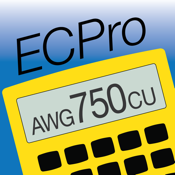 In addition to built-in help, the ElectriCalc Pro electrical code calculator is fully compliant with 2014, 2011, 2008, 2005, 2002, 1999, and 1996 NEC®. Future NEC code updates (FREE) will be available when official by NEC. Electrical Contractors, Designers, Electricians and Lighting Specialists solve tough electrical calculations in seconds and deliver those solutions in conformance with the latest NEC®. The ElectriCalc Pro is a complete electrical reference tool that will save time, trouble and money. •Find Motor Full-Load Amps per current NEC®. Works in 1Ø and 3Ø with the new expanded tables for 3Ø induction (to 500 hp) synchronous (to 200 hp) and DC motors per NEC® 430-247, 430- 248 and 430-250. •Automatically finds NEMA starter sizes. •Calculates service and equipment grounding conductor sizes per NEC® 250-122 and 250-66; plus works directly in electrical terms. 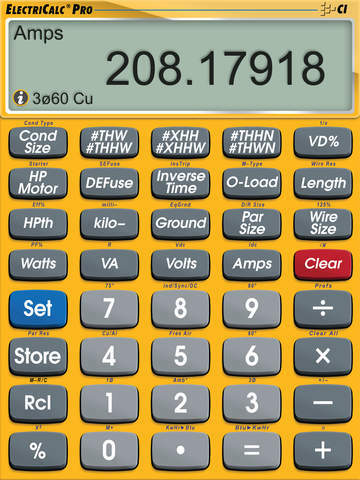 •Ohm’s Law Calculations – enter any two values to solve for the third. Note: Electrical math is universal, however, code-based sizing solutions are based on the US National Electrical Code® (NEC); users in other countries should check with their local Code Officials for applicability. ElectriCalc® is a registered trademark of Calculated Industries, Inc.